Could your kitchen use a facelift? Looking to redo or spruce up your kitchen this year? 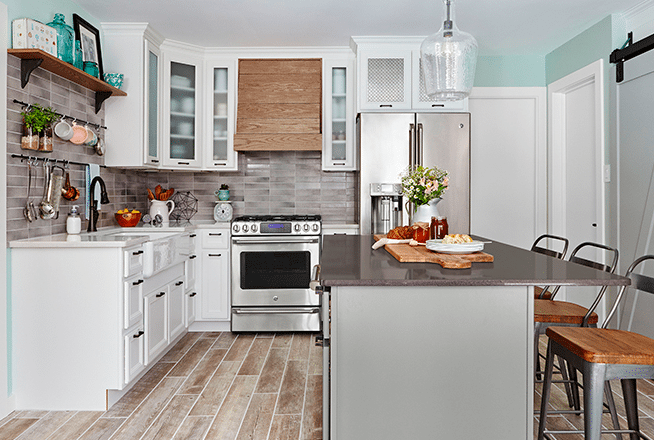 I got the inside scoop from the home design experts at Lowe’s to discover what trends will remain hot in 2018, and a few new trends that may surprise you. Here we dig into the trends, and then provide an estimated effort level required for each project. 1 – Even the non-handy among us should be able to do this.  2 – Handy DIYers should be able to install this on their own. 3 – Professional installation recommended, unless you are exceptionally handy. 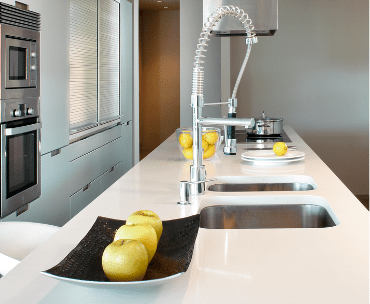 Quartz is quickly becoming the most highly sought-after material for countertops, edging out the once must-have granite. 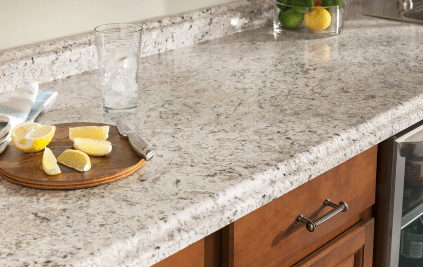 An engineered quartz like the Silestone Quartz Countertop, pictured below, resembles real marble, but is durable and virtually maintenance-free. Hoping for a quartz look on a laminate budget? You’re in luck. Laminate has come a long way since the 1980s, especially with unique and high-end finishing touches like the classy edge on this style. 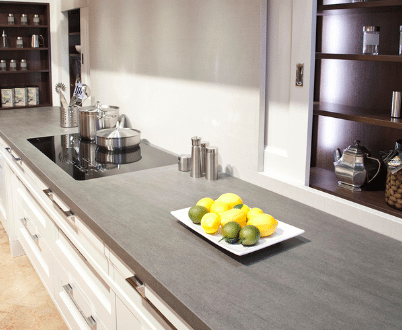 Another trend in engineered kitchen surfaces is sintered stone. This non-porous surface, available in a variety of colors, does not require sealing or polishing and is highly scratch-, stain-, heat- and water-resistant. Even better, it prevents unwelcome germs, bacteria and mildew. As we get deeper into 2018, farmhouse elements in the kitchen continue to be on-trend. White cabinets, mixed materials and apron sinks all contribute to the beauty of this kitchen style. A mix of rustic and traditional elements like a butcher block island and open shelving can add a unique touch for a low expense. Perhaps nothing says “farmhouse chic” more than the “wood-look” tile that’s become popular over the last few years. If your kitchen could use a flooring upgrade and you like the farmhouse look, check it out. 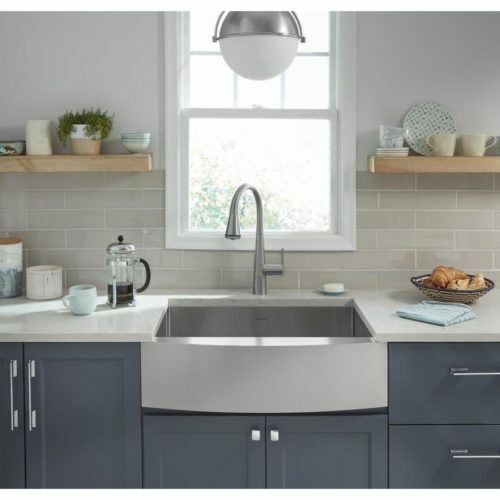 With the farmhouse style comes farmhouse or apron-style sinks. These highly functional sinks are easy to install and come in a variety of materials including stainless steel, copper, granite and cast iron. 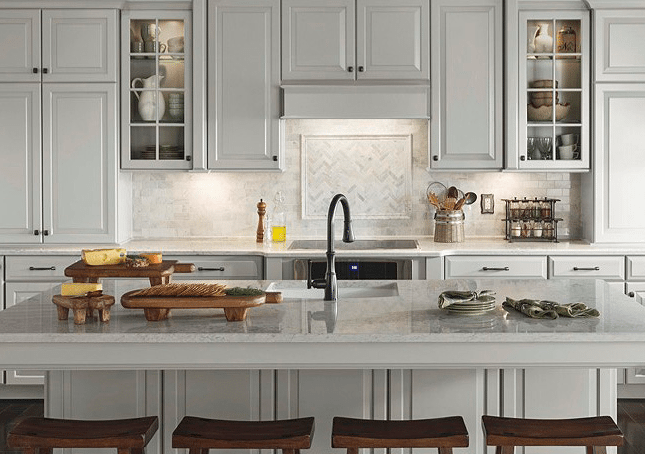 Folks dreaming of a new kitchen have been filling their vision boards with white for years. While this trend is expected to stay, especially in countertops, do expect to start seeing some pops of color or natural elements on a contrasting island or backsplash. Check out this helpful link that can help you identify colors that can complement your existing palette. Maybe I watch too much HGTV, but nothing excites me more than a completely empty kitchen counter—save that beautifully arranged bowl of fruit and a pastry-filled cake stand. 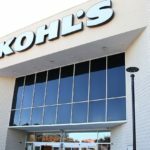 Turns out, I’m not alone, as this is a trend Lowe’s design experts say they anticipate seeing more of this year. But all those dreamy empty counters means my stuff still has to go somewhere. 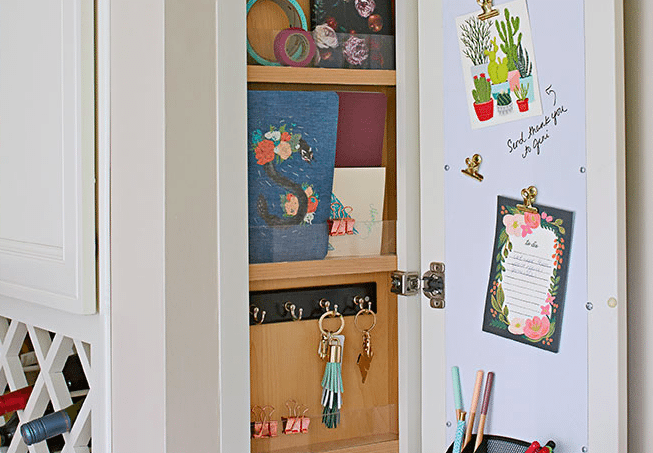 Luckily, new and inventive cabinet storage solutions are becoming increasingly important to homeowners. 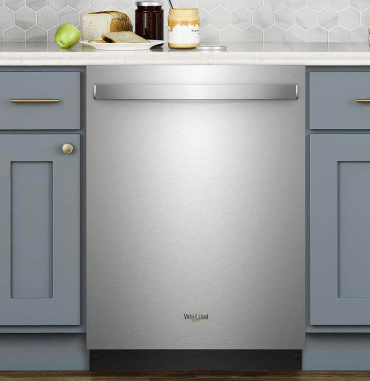 From monitoring your freezer temp to turning off your coffee maker to cabinet sensors that keep kids from finding items they shouldn’t, smart kitchens are all the rage. Iris is a simple, customizable home system by Lowe’s that allows families to monitor their kitchens and simplify their lives. 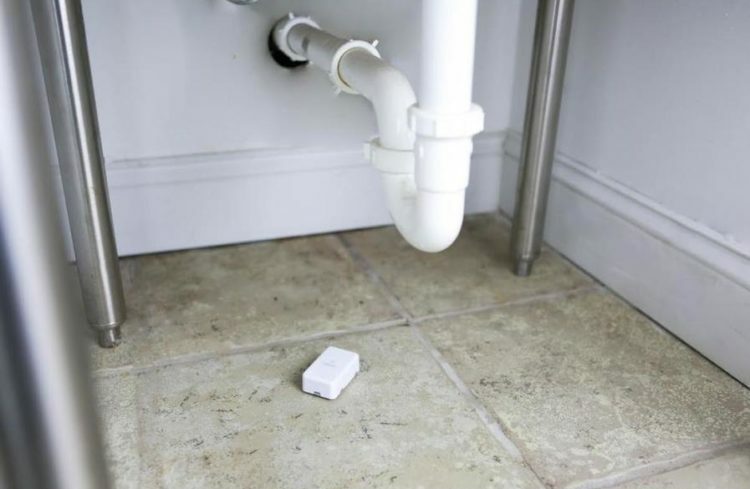 One of my favorite items is this helpful leak sensor that’ll alert you to a leaky faucet before it causes major damage. Place it below any troublesome water sources in your home to help you rest easier. Subway tile is still really popular in kitchen backsplashes and rightfully so. The classic, clean lines make it suitable for all kinds of kitchen looks from farmhouse to modern. 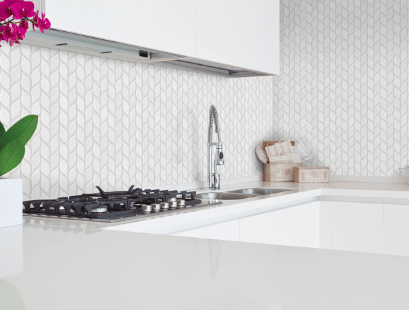 But some homeowners are turning to new and interesting shapes and colors for their backsplash design, like this sleek leaf-shaped tile. Move over shiny stainless steel. 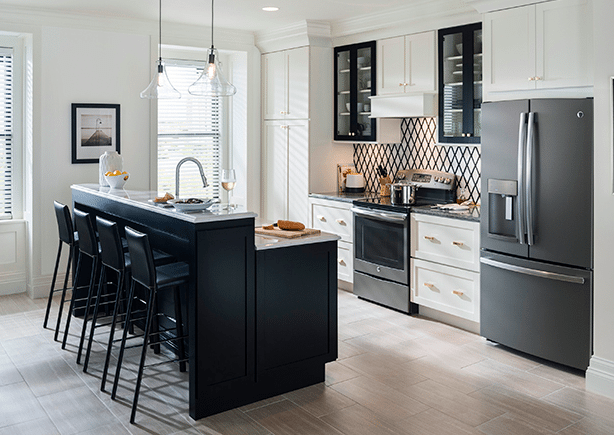 When it comes to kitchen appliances, some of the most popular finishes right now are taking on a darker hue. 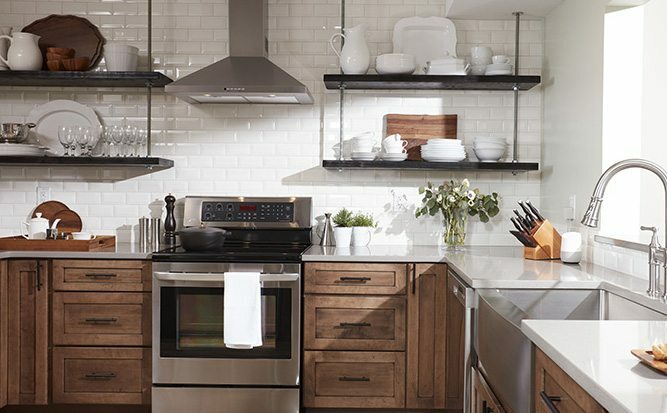 Check out the black stainless, black matte and even black slate options at Lowe’s for your upgraded kitchen. Or consider incorporating a darker shade of paint in the kitchen for a quick fix. 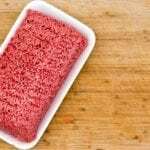 Anyone else tired of cleaning sticky fingerprints off of your refrigerator and dishwasher? Well, looks like the newest trend in kitchen appliances is here to help us out. 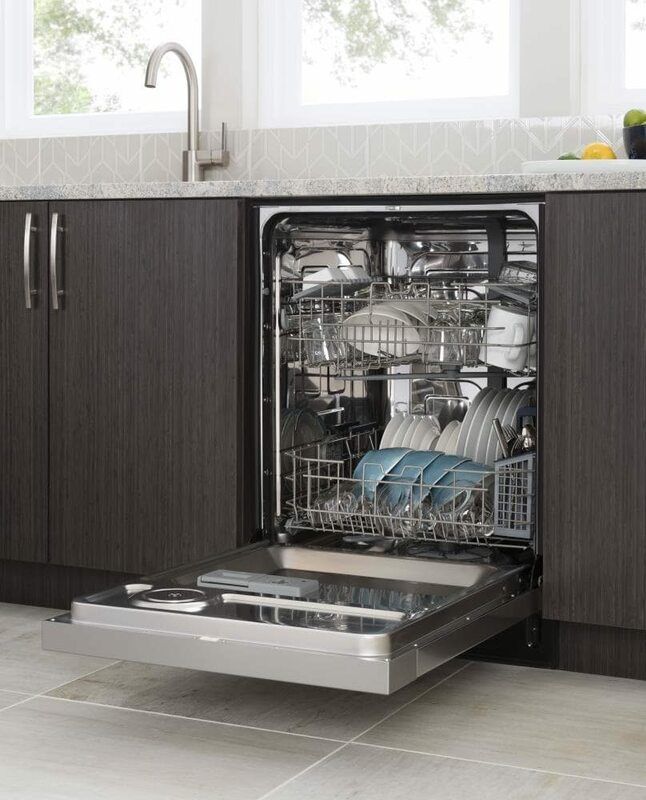 Meet a dishwasher that resists fingerprints and smudges with steel that easily wipes clean. How ingenious is this? Create open shelves using reclaimed wood, or leftover counter material and a pretty bracket. Then, style your shelves with fun dishes and knick-knacks! These open shelves can add an airy feel, making them a nice contrast to heavy cabinetry. 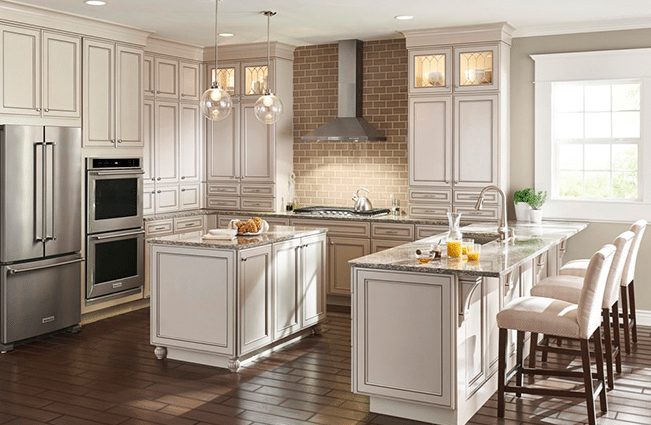 More at-home chefs are wanting the look and feel of a pro’s kitchen. 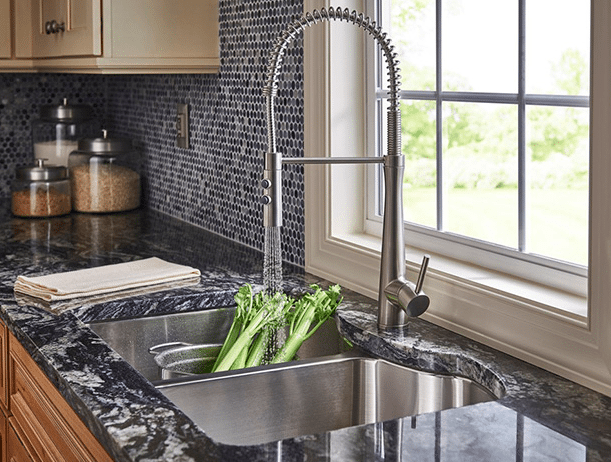 Kitchen faucets with exposed springs is one easy upgrade that brings masterful functionality and style. Is the inside of your dishwasher stainless steel? If not, you may want to consider an upgrade. This luxe feature offers better drying performance, better cleaning performance and a much quieter clean. Bonus, these high-performance appliances are starting to become more affordable too.